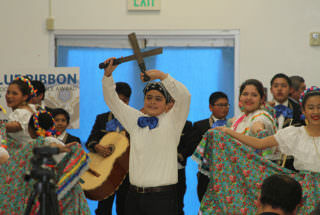 Education leaders in Los Angeles along with families and members of the community of Boyle Heights in East Los Angeles on Thursday celebrated that one of their neighborhood’s schools — KIPP Los Angeles College Preparatory School (KIPP LA Prep) — has been named a 2016 National Blue Ribbon School by the U.S. Department of Education. The National Blue Ribbon Award represents the highest recognition a school can receive in the United States. Recognized as an “Exemplary High Performing School” based on its high achievement on state assessments, KIPP LA Prep was one of two schools within LA Unified to receive the distinction. A total of 279 public schools nationwide — 33 of them in California — were honored with the award. The other in LA Unified was Wonderland Avenue Elementary School, located in the Hollywood Hills. The National Blue Ribbon Schools Program honors schools that achieve very high learning standards or are making notable advancements in closing the achievement gap. KIPP LA Prep demonstrated remarkable results with minority students from a disadvantaged community. Founded in 2003, KIPP LA Prep is a free, open-enrollment, college-preparatory public middle school that serves nearly 500 students in grades 5 through 8. It has a student population in which 98 percent are Latino and 95 percent qualify for free and reduced-price lunch. According to the 2016 Smarter Balanced Assessment, KIPP LA Prep exceeded the averages for both LA Unified and California with 74 percent of the school’s students meeting or exceeding the standards in math and 72 percent meeting or exceeding the standards in English language arts. “KIPP LA Prep shows what a high-quality, world-class education can look like for any child in the U.S., proving that demographics and geography do not determine destiny,” Angella Martinez, KIPP LA’s chief academic officer, said in a news release. KIPP LA serves a total of 6,000 students attending its 13 charter schools located in South and East Los Angeles. It is part of the KIPP network of schools with more than 200 charter schools located in 20 states and in Washington, D.C.